PepsiCo is looking to change its ways. The company has already announced plans to cut sodium, sugar, and fat from its lines of sweet drinks and salty snack foods, but there’s got to be a way to cut out the bad stuff while keeping the same delicious taste. I mean, the only ingredients in Lay’s potato chips are potatoes, salt, and water; how do you change that recipe to have less salt without ruining the main selling point of Lay’s? If you’re Pepsi, you build a better salt molecule. To do this, the company is pouring millions of dollars into researching what they call designer salt. To this end they’ve hired researchers like Mehmood Khan, a former Mayo Clinic endocrinologist, and Derek Yach, a former World Health Organization chronic diseases chief, to get in the labs and work on cutting-edge technology related to the salt curve. The salt curve is that initial spike of saltiness, followed by that deliciously wonderful lingering of salt flavor after the chip has been eaten. 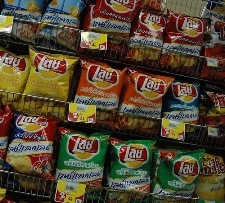 According to Pepsi’s research, only about 20% of salt on Lay’s chips is tasted on the tongue, leaving 80% to be absorbed by the body. The hope is that the designer salt will result in more efficiently-tasted salt crystals. Early results are positive, as taste-tests of the new powdery designer salt have been indistinguishable from traditional salty Lay’s. If successful, this could lead to salt reductions in all manner of PepsiCo products, from Pepsi itself to Quaker granola. Now if you’ll excuse me, I’m dying for a big, salty bag of chips.